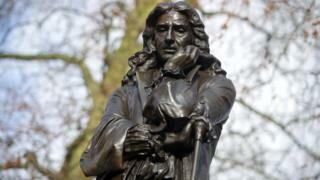 A Bristol MP has called for the removal of a statue honouring the slave trader Edward Colston. Thangam Debbonaire, the Labour MP for Bristol West, said the city "should not be honouring people who benefited from slavery". Edward Colston made his fortune through slave trading, and bequeathed thousands to charitable causes. In April last year, Colston Hall announced it would ditch ties with the 17th Century slave trader's name. Speaking at a Black History Month event at Bristol's City Hall, attended by Labour leader Jeremy Corbyn, Mrs Debbonaire said: "Having statues of people who oppressed us is not a good thing to be saying to black people in this city. "Edward Colston did many things, but he was not completely defined by that, and it's an important part of saying to black people in the city 'you are welcome'. "I think it actually provides a good opportunity for us as a city to talk about that history." On the Colston Hall name change, Mrs Debbonaire said she was "really glad it's happening". "I know it's controversial, but the world's not going to fall down because we're renaming some buildings," she added. Bristol City Council, who administer statues in the city, had planned to add a second plaque to the statue. The authority has been approached for comment about Mrs Debbonaire's comments.